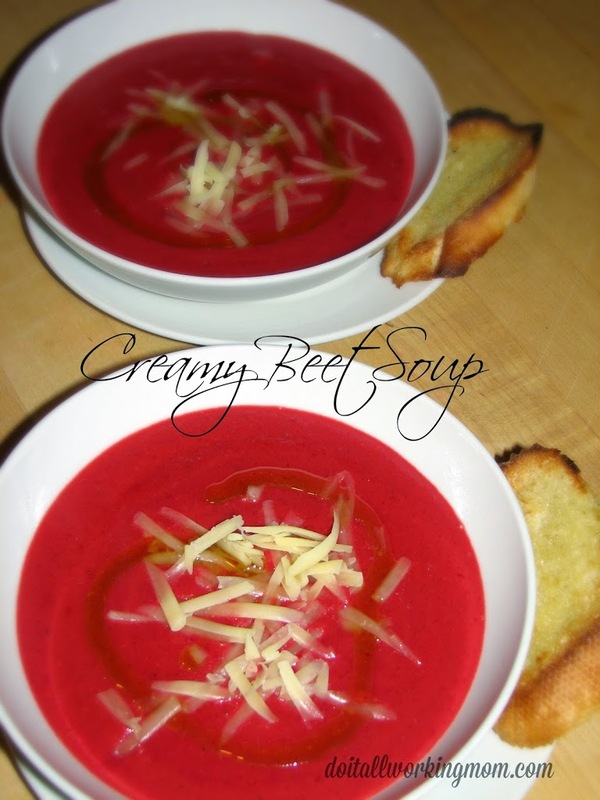 Impress you guests whit this simple, delicious and healthy Creamy Beet Soup. This is the perfect soup to entertain during the colder months. After serving this tasty beet soup, be ready to be complimented on your culinary skills. 1- Boil the beets until tender (about 15 minutes). 2- Peel and cut the beets into cubes. 3- In a large cooking pot, heat the butter, add the beets, potatoes, onions and sauté for 5 minutes on medium high heat. 4- Add the coriander, chicken stock, salt and pepper and bring to a boil. Reduce heat, cover and let simmer for about 30 minutes or until vegetables are tender. 5- With a hand blender, purée the soup until smooth (you can also use a counter top blender). 6- Add the cream and cheese and cook at low heat for another 10 minutes. When you are ready to serve the soup, garnish with grated old cheddar cheese and a drizzle of olive oil. Boil the beets until tender (about 15 minutes). Peel and cut the beets into cubes. In a large cooking pot, heat the butter, add the beets, potatoes, onions and sauté for 5 minutes on medium high heat. Add the coriander, chicken stock, salt and pepper and bring to a boil. Reduce heat, cover and let simmer for about 30 minutes or until vegetables are tender. With a hand blender, purée the soup until smooth (you can also use a counter top blender). Add the cream and cheese and cook at low heat for another 10 minutes. Beet soup? I have never liked beets. Looking over the recipe, it does sound interesting. There is a combination of ingredients that may be tasty. Yes it’s a great combination! I’m not sure about this one, I’m scared of beets, lol. Visually it is stunning, I’m just still that little girl who hates her beets, lol! LOL, I understand but you should give it a try. It’s delicious! Thanks Jenny, I’m pretty sure your husband would love this soup! I’m sure it would be just as good without the cream. Not a huge fan of Beets, but I am sure willing to try it! Beets are so good for you and this soup is delicious. Try it! Let me know how you like it if you decide to try. I have never tried cooking beets in any way, but have heard that they’re great for the liver. Since I have liver disease, I might need to try this.